(Wisconsin’s folly) Foxconn? More like FoxCON! 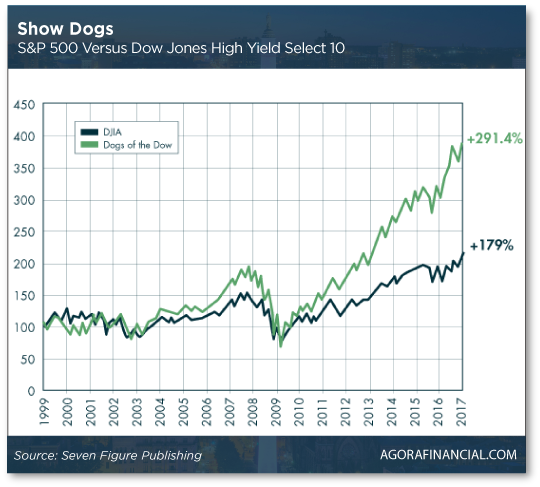 “One of the most successful investing strategies of all time is to follow the Dogs of the Dow,” says our income and retirement specialist Mike Burnick. The investment strategy was popularized in 1991 by Michael B. O’Higgins in his book Beating the Dow. “It’s a classic value investing strategy that could be primed to work even better this year if the market remains shaky in the face of a slowing global economy and trade battles,” says CNBC. 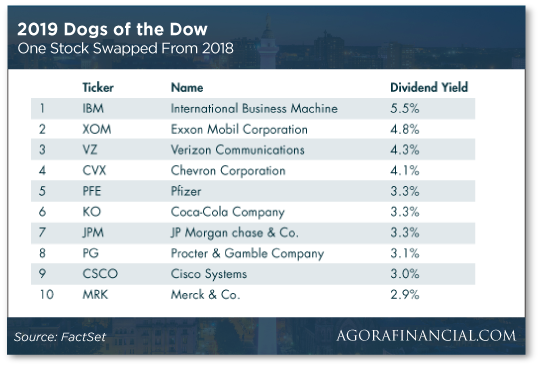 Here’s how it works: At the closing bell of the stock market on the last day of the year, pick the 10 highest dividend-yielding Dow index stocks. Then — on the first trading day of the new year — invest equally in each. Hold these 10 stocks for the year… and repeat the process each following year. Mike says: “By targeting the highest-yielding Dow stocks, you are essentially buying the dip. And the high dividend yields indicate compelling values and often result in market-beating capital appreciation as well. “In fact, the Dow Dogs have beaten the overall DJIA returns seven of the last 10 years. That includes 2018 — the strategy managed to curb losses to 1.5% versus 6% losses for the broader Dow index. “That’s an incredibly consistent track record of outperformance,” says Mike. And the Dow Dogs are so well liked they have their own index — the Dow Jones High Yield Select 10 Total Return Index. Mike says: “The stocks that make up the Dogs of the Dow tend to change every year. To Mike’s way of thinking: “You could buy all 10 of the Dogs of the Dow or an ETF that mirrors them” — it’s not a bad strategy — but it’s a long-term portfolio strategy. Starting as early as TODAY, Jan. 31. It might sound improbable but as soon as you see this short message, you’ll understand the entire time-sensitive situation. View now by clicking right here… And please don’t wait; this video will be removed from the internet at MIDNIGHT. To the markets… where the glow from this year’s model of Federal Reserve policy is carrying into a new day. The S&P 500 is up more than three-quarters of a percent and the Nasdaq is up nearly 1.5%. Only the Dow is lagging, down fractionally. The Fed left interest rates alone after its latest meeting yesterday. That part was no surprise. What had traders on pins and needles was whether the Fed would stick with its new “patience” policy. Back on Jan. 4, Fed Chairman Jerome Powell let it drop that the Fed would be “patient” in deciding on the pace of interest rate increases this year — a major departure from stated Fed policy only a couple of weeks earlier. “Patient” is a word pregnant with meaning in the Fed’s lexicon — it sent a major signal to markets at a crucial juncture in early 2015, for instance. So the big question was whether Powell would stick to the revived “patience” script during his press conference yesterday. With that, the market turned in its best one-day performance yesterday since… well, since Powell first trotted out the word on Jan 4. Meanwhile, another revised plank of Fed policy is propelling gold to an eight-month high at $1,320. But Jerome Powell alarmed investors in December “when he told us that the Fed’s balance sheet ‘runoff’ would be on autopilot for the foreseeable future” (emphasis added). Investors took that to mean the Fed would continue to drive interest rates higher — economy be damned. Zach says: “A decision by the Fed to take more time with its bond portfolio sets off a chain reaction in the markets.” The good kind of reaction… particularly for gold investors. And an increase in profits drives gold miner stocks higher! “Best of all,” he says, “gold has plenty of room to run. After all, gold futures hit a peak above $2,000 per ounce in the years following the financial crisis. “Foxconn is reconsidering its plans to build a manufacturing facility that was supposed to create 13,000 blue-collar jobs,” according to an article at Reason. Not just “reconsidering”… the company’s all but sh*tcanned the entire Wisconsin folly. As we reported here at The 5 in June 2018: “Foxconn, the Taiwanese electronics giant, will build a factory in Racine County making TV and computer screens. Now? Not so much… And the state of Wisconsin should’ve seen the handwriting on the wall. Now Louis Woo — assistant to Foxconn’s chairman — says: “In Wisconsin we’re not building a factory.” Blunt enough for ya? 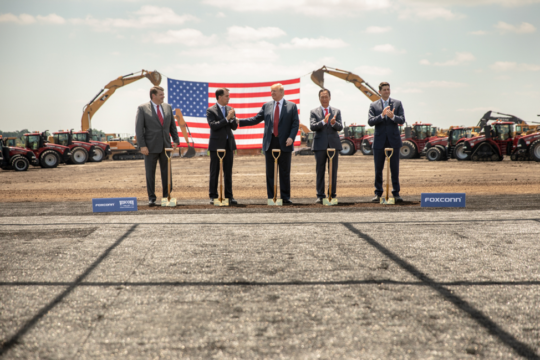 Rather, Foxconn has tentative plans to devote a Wisconsin facility to research and development. “The jobs created are likely to be ‘knowledge’ positions — in other words, not blue-collar jobs,” Reason says. It gets better, folks… Foxconn plans to hire workers from Taiwan and China. “It was always pretty unlikely that the Foxconn deal would live up to the promises made by the company, Walker and Trump,” Reason concludes. “A single woman with two kids (husband skipped out) working 50 hours per week, 52 weeks per year at $7.75 per hour will take home (after Social Security and Medicare) $1,550 per month plus $40 in food stamps (in Georgia). “After apartment $800 (if very lucky), $400 (day care), electricity/water ($300) and car insurance ($100) there is nothing left for medical/dental, gas, clothes, shoes, TV, phone or even groceries. “Rents are increasing nationwide at 4–7% per year, wages 2–3%. (Read at least some of Matthew Desmond’s award-winning, eye-opening Evicted.) For the lower and some ‘middle’ class, there no longer is an American dream. “They may not know what socialism actually is or what Scandinavian economics are, but they do know that something must change. You could retire as early as TODAY, Jan. 31.